The DMIC Project being developed on either side of the Western Dedicated Freight Corridor as a global manufacturing and investment destination, has made significant strides since inception. It spans 1483 KMs between the political capital and the business capital of India, i.e. Delhi and Mumbai. New industrial cities in the DMIC region are being benchmarkedagainst recently established industrial cities in other parts of the world. A 6-lane intersection-free expressway connecting the country’s political and financial capitals and a 4000 MW power plant. This Dedicated Freight Corridor envisages a high-speed connectivity for High Axle Load Wagons (25 Tonne) of Double Stacked Container Trains supported by high power locomotives. 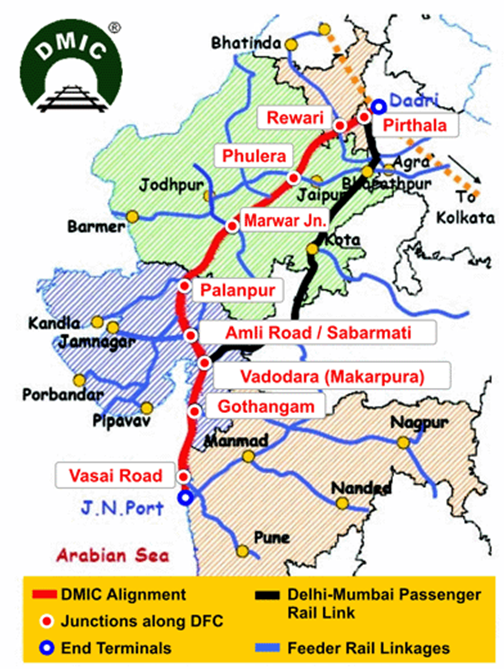 The Delhi – Mumbai leg of the Golden Quadrilateral National Highway also runs almost parallel to the Freight Corridor. This corridor will be equipped with an array of infrastructure facilities such as power facilities, rail connectivity to ports en route etc. Approximately 180 million people, 14 percent of the population, will be affected by the corridor’s development.